Everyone is busy now days. Whether you are always running to jobs, running after children, running to class, everyone constantly has something to do. Relaxation is a rare thing that usually only occurs in holidays (if you get one at all). Opportunities to spend time to do something you want to do, to teach yourself something new are rare. One way to ‘catch two birds with one swoop’ (the vegan version of ‘kill two birds with one stone’), is by reading. As a big fan of reading myself, I find that it is an excellent way to learn and relax at the same time. After becoming vegan I slowly became more and more interested in books on veganism and ethics. Like most people, I usually do not choose a non-fiction book as my first reading preference as I find them so boring. They are always full of thousands of facts, long paragraphs and extremely long chapters all of which usually put me to sleep. In the race to find something worth my time, I happened to stumble across ‘The Ethics Of What You Eat’ by Peter Singer and Jim Mason. 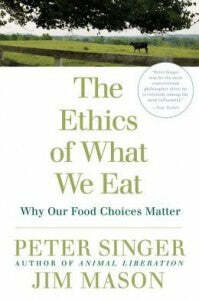 A fan of Peter Singer I thought I will may as well give the book a go. This book is about a ‘study’ of three families in America, one who ate whatever was cheapest and readily available, the second, a family who ate meat but tried to find the most ethical companies possible, and the third, a family entirely vegan. The book is split up into three sections, one for each family. The families are interviewed, Singer and Mason go on excursions with the families to supermarkets and then chat with the families at home. Then the products they buy are researched. Whether it be fish, meat, eggs, lettuce, all products are researched and important questions are answered through the book. These include; ‘Is it ethical to raise vegan kids?” (spoiler, yes :), ‘Is buying locally better than buying from developing countries?’, and ‘Does buying organic making an environmental difference?’. These questions are explored in depth, with scenarios, real life examples, facts, statistics and real life people. The great thing about this book is that it always presents both sides of the argument, leaving the audience to make up their own minds about lots of different topics. It also talks about everything that is happening in Australia as well. When it mentions products in America, it gives equivalents in Australia. I have never in my life learnt more about modern agriculture and animal rights than when I read this book. I have thoroughly enjoyed it and I am even more certain of my choices as a vegan and more notably have now begun to change certain products I buy in supermarkets to make even more of a difference. Was it blasphemous for humans to transform Burmese jungle fowl into the modern chicken? If GM corn is ‘unnatural’, so too is the turkey with a breast so large that it can only reproduce through artificial insemination. Why should one way of changing species be ‘playing God’ or contrary to nature and the other not? Unless we are to turn our back on the domestication of plants and animals and revert to being hunter-gatherers. we cannot logically hold that interfering with the nature of species is intrinsically wrong.